The Cornwall Workshop starts next Friday, 18th of October. This weeklong residential workshop for artists, critics and curators presents an opportunity to examine, discuss and participate in the arts ecosystem of Cornwall and the South West of England. Participants from the region and abroad will come together for a week of activities under the leadership of artist Simon Starling. The workshop opens with two public walks by Hamish Fulton, who, 40 years ago in 1973, completed a walk of 1,022 miles from Duncansby Head near John O’Groats to Lands End in Cornwall. 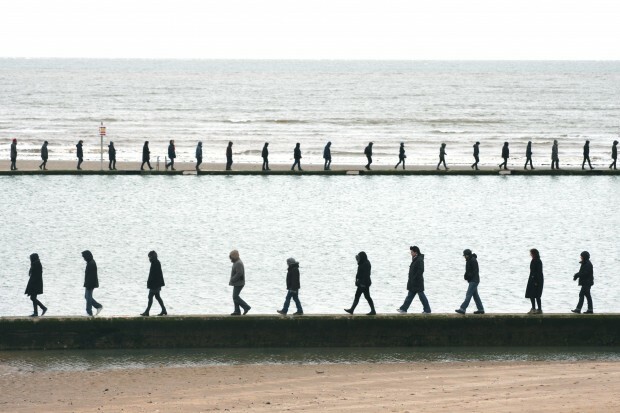 The walk had taken 47 days to complete and on arrival at his destination, Fulton committed himself henceforth to ‘only make art resulting from the experience of individual walks’. On the weekend of 19-20 October, Fulton will commemorate his 40-year-old pledge with two public walks, which participants in the Cornwall Workshop will attend, along with anyone else interested in taking part. Through its movements, the group will draw a picture on the land, which will exist only as long as the group is walking. We will walk together and alone, in silence. I will be writing about the experience of the walks and inviting the workshop participants to do the same, with the lucid spirit of Fulton’s walks, photographs and text pieces in mind. This entry was posted on October 10, 2013 by ellendw.